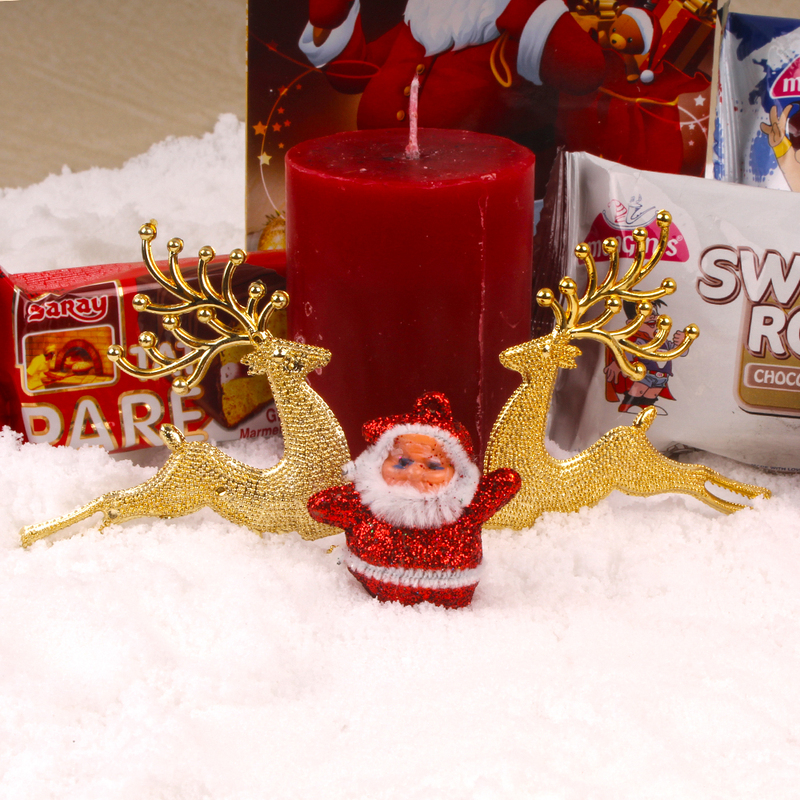 Product Consist : Christmas Greeting Card with 2 Reindeer and 1 small Santa with 1 Bar Candle along with Packets of Assorted Delicious Cakes (Swiss Roll, Tat pare and Muffins Cake - Total Weight : 250gms). 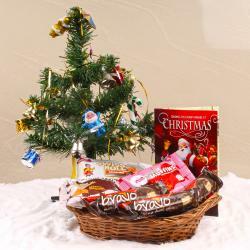 Wish to buy an awesome gift hamper with superb contents than check out this Christmas gift hamper of Giftacrossindia.com which is all set to surprise you with its contents. This Exclusive Christmas Gifting Combo comes with Christmas decorative like pair of reindeer, small Santa, a candle along with Christmas greeting card to convey your message and good wishes. 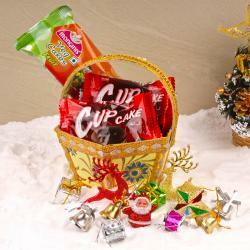 This hamper comes with lovely treat of spongy cakes mix packs. 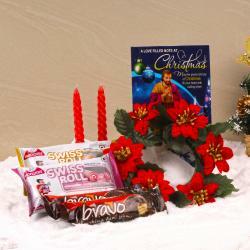 So, hurry up and book your order now and send your best wishes to your dear ones with this Christmas gift hamper. 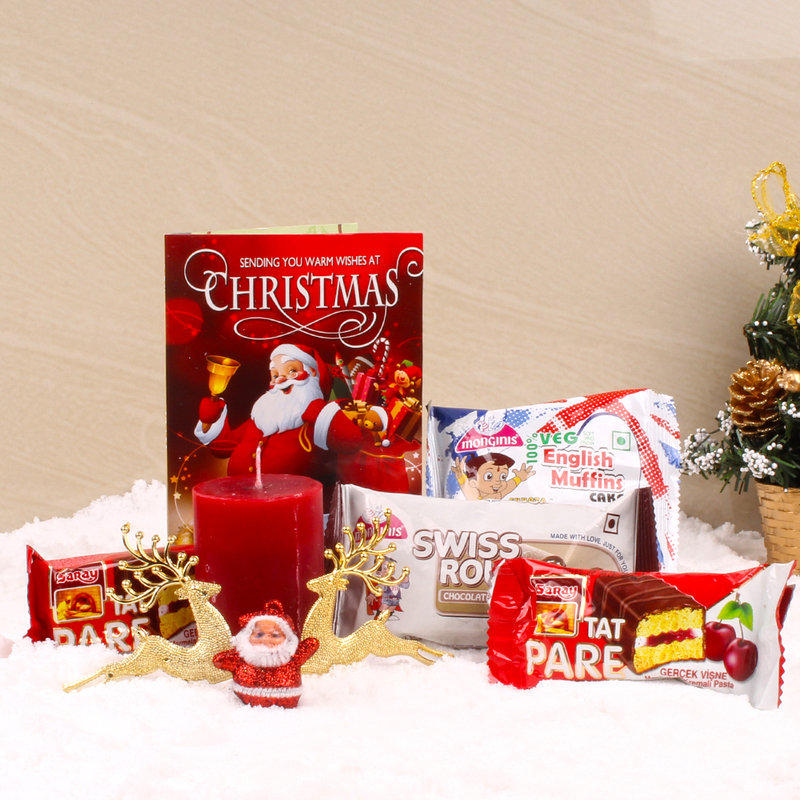 Product Consists : Christmas Greeting Card with 2 Reindeer and 1 small Santa with 1 Bar Candle along with Packets of Assorted Delicious Cakes (Swiss Roll, Tat pare and Muffins Cake - Total Weight : 250gms).